This product is suitable for M.2 SSDs with PCI-E (M-KEY) interface type. The PCI-E interface implements the NVMe protocol standard. Currently, all products on the market only support PCI-E M.2 hard disk, M.2 hard disk that does not support SATA protocol, this product adopts Type-C interface, aluminum alloy shell design, surface shell with trunking design and two side ventilation holes design, both beautiful and enhanced heat dissipation effect, no need drive, hot swappable, and strong compatibility. This product can only be used as a mobile hard disk box, and can not be cloned as a system disk. For the first time using this product, you need to initialize the inserted hard disk for system partitioning. USB 3.1 Port support the speed of data transmission up to 10Gbps,give you a steady and efficient data transfer. Downwards compatible with USB3.0. Does not read M.2 NVME WD Black. Easy Setup, Hot-swappable, Plug and Play, No Driver required. 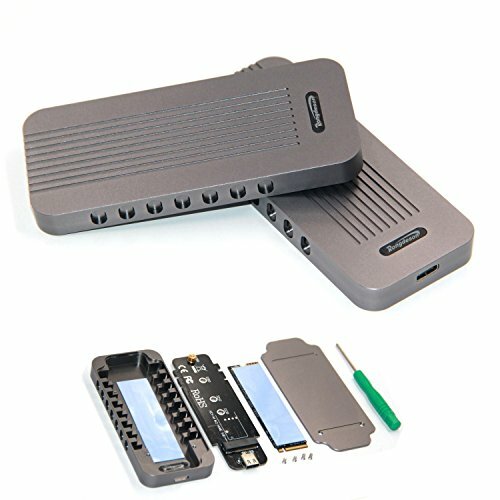 With LED indicator, easy to control SSD working status. A several-times increase in performance can significantly reduce latency. Support Samsung 950Pro/ 960Evo/ PM951/ PM961/ SM951/ SM961. Do not with WD Black/ Liteon NVME drives. Aluminum alloy sandblasted shell, comfortable and beautiful. Professional Aluminum Case; Ultra slim design for a modern look. Portable yet durable, ideal for traveling. Vents Design for Heat Dissipation; Greatly reduce power consumption, large heat dissipation area and heat dissipation stronger. Provides heat dissipation and data saver for your systems. The Type-C interface supports positive and negative insertion. There is no directional requirement, which improves the ease of plugging and unplugging the USB interface and provides a better user experience. Only for M-Key M.2 SSD (PCI-E NVMe-based), doesn't support B-Key SSD(SATA-based) and M-Key M.2 SSD(PCI-E AHCI-based), applicable to size 2230 / 2242 / 2260 / 2280.